Brazil's President Michel Temer, left, and Argentina's President Mauricio Macri, take part in a joint press conference at the government's official residence in Buenos Aires, Argentina, Monday, Oct. 3, 2016. AP Photo/Natacha Pisarenko. Economic shock therapy is back in Argentina, or at least that is a common policy description of President Mauricio Macri’s first ten months in office. Despite the catchy headlines, however, this description does not tell the whole story. Indeed, while Macri has implemented a series of far-reaching liberalization measures in open rupture with the politics of his predecessors, Cristina Fernández and Nestor Kirchner, such a change does not represent a full-blown return of the so-called “Washington Consensus”. In addition, there is not widespread agreement on whether Macri’s approach is the right one. In other words, the policy U-turn is not accompanied by an overwhelming sense of disenchantment with the previous model – a populist leftist approach. This is why, in order to fill the gap, Macri has deployed a double strategy: on one side, he has shown himself keen to keep in place a number of acclaimed social programs adopted by the former administration, while on the other he has been attempting to portray the overall economic inheritance bequeathed by the Kirchners as a catastrophe. Lambasting one’s predecessors is not a new phenomenon in Argentinean politics, but while it was somewhat warranted following the economic crises in 1989 and 2001, this time such a calamitous depiction seems to be more driven by ideological motives than actual socio-economic disarray. In this sense, Argentina under Macri is an intense battlefield, a conflictive laboratory anticipating a bitter dispute between opposite political narratives in the whole region. The policy U-turn is not accompanied by an overwhelming sense of disenchantment with the previous model – a populist leftist approach. By appealing to the principles of entrepreneurship and modernization, and under the slogan "every day, a little bit better", Macri was elected on the promise to improve an economy that, since 2011, had certainly faltered and revealed a number of bottlenecks. High inflation (though by no means hyperinflation), low growth and fiscal deficit were among the most visible ailments that Macri pledged to heal. After assembling a cabinet filled with CEOs and executives, Macri moved on to abolish the "dollar clamp" (a series of foreign exchange controls) with the ensuing devaluation of the peso, eliminate gas and energy subsidies resulting in a massive energy bill hike, and eliminate or lower taxes for agricultural exports, thus doing away with an important source of government revenue. As a result, inflation has slightly lowered, but not as much as expected (with the 10% target by the end of Macri’s mandate still far away), while the primary fiscal deficit continues to be a cause of concern, as it deepens the country's indebtedness. But it is the growth figures that have generated major disappointment, with a foreseen 1.8% contraction of the GDP in 2016 according to the Economic Commission for Latin America and the Caribbean. Even The Wall Street Journal, a traditional supporter of pro-market reforms, advanced some perplexity in a recent article. The honeymoon between the President and the electorate has thus been spoiled, with Macri’s approval rating plummeting from 63% to 40% according to pollster Hugo Haime. Along with the bill hike, now partly mitigated by an intervention from the Supreme Court, it is the approach towards layoffs adopted by the new executive that has sparked much opposition. This has led the three major trade unions to regroup and take to the streets following several years of relative social peace. After a politically motivated layoff of public servants totaling around ten thousand workers, Macri has vetoed an anti-layoffs bill intended to alleviate a much larger wave of firings in the private sector. The presidential veto came after a parliamentary defeat that highlighted the first fractures within the bloc supporting the government. Such a setback contradicts an otherwise successful management of Macri's coalition’s lack of a majority in either parliamentary house: on one side, he has often bypassed Congress altogether through presidential decrees, on the other he has forged a post-vote alliance with other political actors. An area in which Macri has been widely praised is the reestablishment of “normal” international relations. As emphatically put by the President in a recent interview to Agencia EFE, "Argentina has come back to the world, there is no better place to invest." His speech at the World Economic Forum in Davos and the visits of Barack Obama, François Hollande and Matteo Renzi in Buenos Aires were seen as unquestionable signals of revitalized international dynamism. Behind this acclaim, however, was the decision to give in to the request of some American “vulture funds” to pay back billions of dollars for what was effectively a speculative operation. The honeymoon between the President and the electorate has thus been spoiled, with Macri’s approval rating plummeting from 63% to 40%. While this permitted Argentina to regain access to capital markets after the blockage imposed by a New York Court, it also introduced a new burden for the government budget. This has also been accompanied by a tax amnesty law intended to attract back money held abroad by Argentine tax evaders – a move that critics say favors the President himself, as he has been linked to eight tax haven companies in the “Panama Papers” (the list of leaked documents of thousands of offshore companies that has recently become public). 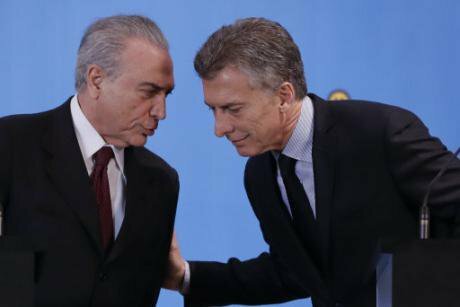 As for regional relations, Argentina was prompt to recognize the new Brazilian government of Michel Temer, whose unorthodox way to power has raised some eyebrows even among the continent’s most moderate presidents, but has helped Macri find a powerful like-minded ally. Not all international efforts have proven successful, however. Pressured by public opinion, Macri recently claimed to have informally agreed with Theresa May to discuss the sovereignty of the Falkland Islands, though he was swiftly belied by London and by his own foreign minister. Even more problematic has been his relationship with the Vatican. Pope Francis, an Argentine himself, has maintained a cold attitude towards Macri, as noted by many commentators, and recently declined a governmental donation to a Vatican foundation. The growth of poverty since the beginning of Macri's mandate may have only reinforced Bergoglio's circumspection. Macri's opposition does not necessarily fare much better. Cristina Fernández has been involved in a series of corruption investigations, which she claims are politically motivated. Her recent return to Buenos Aires after months spent at her residence in El Calafate suggests that she may return to lead the Front for Victory. Within the Justicialist Party, with Front as its left-wing faction, there is talk that a primary election may take place next year: a perspective endorsed by Sergio Massa, a moderate Peronist currently backing the government in Parliament but with ambitions of his own, and yet rejected by many exponents of the Front who would prefer to have the party fully behind them. At a grassroots level, social movements of different political persuasions have begun to gain some traction. However, the incarceration of social activist Milagro Sala, a move that attracted Macri much international criticism, is still fresh in people’s minds. After 13 years of political hegemony, the leftist populist camp has given way to its nemesis. But it would be wrong to infer from the opposition's uncertainties that it has fully retreated. Rather, the current situation suggests a more nuanced balance: the entitlement of social rights and the consumerist hype fostered by the Kirchners represent a bulwark against the full implementation of the Macri project. After 13 years of political hegemony, the leftist populist camp has given way to its nemesis. In this sense, the Argentinean case is indicative that, despite some signs of exhaustion due to the world economic crisis and its own contradictions, the “pink tide” experiments in South America cannot be swept away all too easily.